But the mountain, which already hosts thirteen observatories, holds religious and cultural significance to Native Hawaiians. Some Natives consider the placement of yet another observatory—especially a 180-foot tall giant like the TMT—to be a desecration of sacred ground. 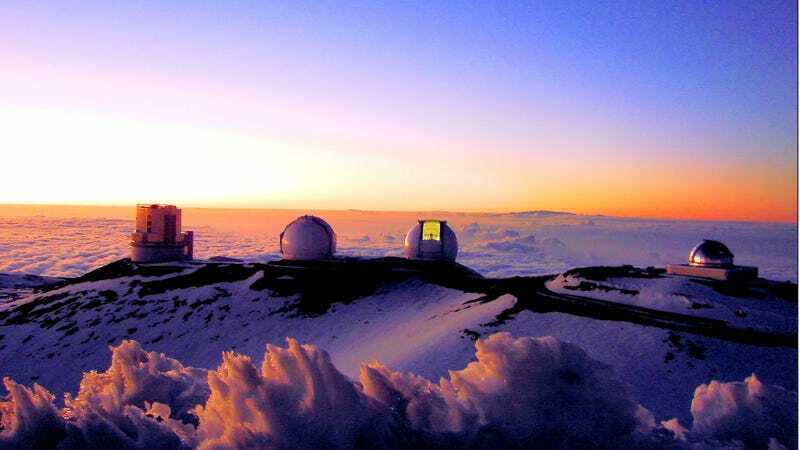 Bad feelings about the TMT are compounded by Hawaii’s long history of colonialism, including decades of development atop Mauna Kea for astronomy. The controversy came to a head in the spring of 2015, when protestors blocked construction crews from heading up the mountain to break ground for the TMT. Construction was stalled as the Native-led movement against the telescope garnered international attention and support, and as opponents got organized and took legal action. In December 2015, Hawaii’s Supreme Court nullified the telescope’s construction permit on grounds that it violated due process—it was issued before opponents were allowed to air their complaints in a contested case hearing. A lengthy contested case hearing ensued in the fall of 2016 and early 2017. Uncertain about their future in Hawaii, the TMT board secured a backup construction site in Spain’s Canary Islands. But in July, former judge Riki May Amano sent a recommendation to the Board of Land and Natural Resources that the telescope’s construction be allowed to move forward, according to Hawaii News Now. And on Thursday, in a 5-2 decision, the land board decided to issue a new permit. While it’s a victory for the TMT, the fight isn’t over: Opponents are already filing motions to put the permit on hold until an appeal can be heard by Hawaii’s Supreme Court. In an email to Earther, Kealoha Pisciotta, a representative of the Native Hawaiian organization Mauna Kea Hui, emphasized that the final decision will be made by the courts, which last December ruled that the TMT’s sublease agreement with the University of Hawaii was invalid. “The long and short is that they they don’t have the green light to move ahead at all,” she said. Update: This article has been updated with comments from Nick Suntzeff and Kealoha Pisciotta. It has also been updated to clarify that the telescope’s construction on Mauna Kea is still pending a Supreme Court decision.